What inspired you to learn to make the kilt? I love Scotland and the Scottish culture for a long time and to learn making kilts was a dream I have had for a long time as it is something special for me on personal basis. I also very much appreciated working with tartan! It is a very special and high quality woven fabric what I loved to work with. Why did you choose Askival of Strathearn Kilt College? 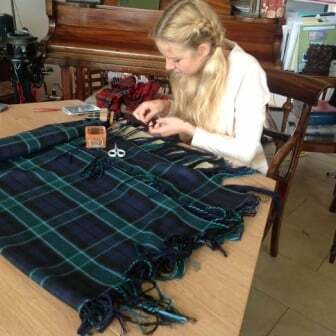 Askival of Strathearn Kilt College was suggested by a kilt maker in Glasgow. They had a very high opinion of the quality and way of teaching at the Askival of Strathearn Kilt College. The result cannot be expressed in words on a special personal way, because I found wonderful people who became more than friends. I never had a better teacher, with more know-how and expertise in her field like you. With an incredible amount of patience and humour. You are teaching your deep knowledge to everybody who is interested. The result is more than I can describe with words – a wonderful black kilt, created together and which I love to wear. How did the Kilt College help you? I learned a lot about the kilt making, the Scottish culture and other Scottish handcrafts which are really special for me. It opened my “head” again for new skills and the love to hand make unique pieces, which are all special in their own way. My stay at Askival of Strathearn was very special in many ways and gave me a new way of thinking. Askival is a place to love. The atmosphere is totally peaceful, with a very high energy and creative flow on the same time. It is a perfect mix between traditional work and a place where new and crazy ideas will always be heard. My scariest moment was, (I had more than one from this moments), when I had to unpick the pleats after hours of work realizing everything is much too big and the kilt grew 6 cm!!! But it is worth to work detailed and accurate, that’s what I learned, too! One of many best moments was having porridge together with you and other students in the sun, having fun while sewing in the group listening to “Earth, Wind and Fire” and the feeling wearing my kilt for the first time and feel like a princess. What did I particularly like about the approach or delivery? It is a very warm and welcoming place combined with the highest level of knowledge and experience. 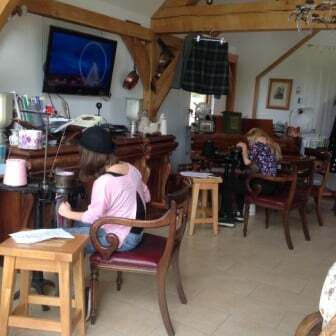 A perfect place and environment to learn a challenging process like kilt making. Would you recommend the business to others? If so, who, what, and why? 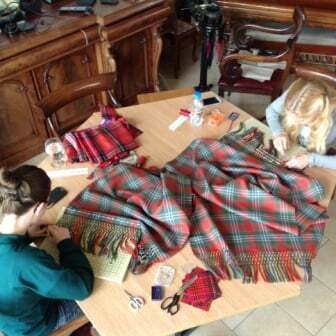 I suggest this course to everyone who is interested in learning kilt making, who is interested in Scottish culture and handcrafts or just a fan of sewing and handmade things or someone who is looking for a new great challenge for life with a lot of fun! For 7 weeks in July and August, two fashion and design students from Austria and one from Florence have been with me. They have been learning about the tailored kilt, the tartan and other aspects of the Highland attire for men and women. They learned about the tailoring techniques – the stitches and use of the steam, rebuilt a kilt, made the Little Tailored Kilt for a toddler, tartan ties and bow ties, the lattice knotted stoles and the purled fringed plaids, training and demonstrations aids for my tourist presentations and training workshops, also learned how to use the 100 year old cylinder sock machines and managed to turn a heel. A wonderful and helpful experience for both the intern and me. In 2015, A young tailor from Berlin who had just finished his three year apprenticeship as a bespoke gentleman’s tailor came to Askival of Strathearn for a 3 month apprenticeship to learn about the bespoke tailored kilt. We also had the wonderful opportunity to share this experience and become friends with a local retired bespoke tailor who comes from a dynasty of tailors. We have been able to discuss the tailoring processes and techniques with fresh eyes, with an aim to clarify and develop understanding, knowledge and skills and in turn, enable others to learn the craft of kilt making with a good degree of understanding.